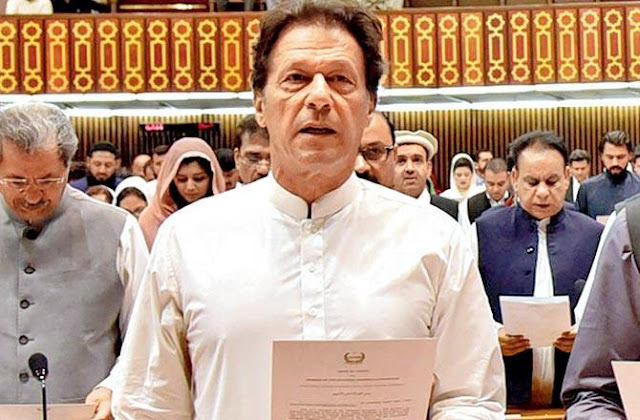 Awami Muslim League (AML) chief Sheik Rashid on Wednesday submitted the nomination papers for Pakistan Tehreek-I-Insaf Chairman Imran Khan's offered for prime minister to the National Assembly secretary on Wednesday. Rashid, while addressing the media in Islamabad, said he was Khan's nominator for the post, while Fakhar Imam was the underwriter. "We submitted the papers for Imran Khan's nomination," Rashid affirmed. The AML chief said that Imran Khan would be chosen as prime minister on Aug 17 and would be confirmed as prime minister the next day at a pledge taking service. Khan was selected as the PTI's pick for PM amid a gathering of senior gathering pioneers at Banigala, as indicated by representative Fawad Chaudhry. In the interim, the PPP and PML-N have bolted horns over the joint restriction's nominee for prime minister. In spite of the fact that the 11-party restriction organization together, involving the PML-N, PPP and others, had prior collectively acknowledged PML-N President Shahbaz Sharif as their nominee for the post, PPP's Khursheed Shah told Dawn on Tuesday that the gathering had reservations over the nomination, which it had passed on to the PML-N. In any case, in what gave off an impression of being a political strategy, he endeavored to make light of the issue, depicting it as "unimportant". He said the PPP was in contact with the PML-N and the issue would be settled genially. PML-N's Mushahidullah Khan today expelled recommendations that the gathering change their nominee for PM. "Shahbaz Sharif will remain our nominee," he declared. "The PPP is currently attempting to motivate us to change our nominee in the wake of taking votes from us (for the NA speaker and delegate speaker decisions)," he asserted. "On the off chance that Bilawal is to choose PML-N matters, at that point why not give Shahbaz Sharif specialist over the PPP's undertakings?" he inquired. "Later on, we'll settle on their choices, and they can settle on our choices," he commented severely. "Indeed, even military law directors did not manage thusly," he included. The PML-N pioneer went above and beyond to propose that the Opposition Leader in the Senate be changed. "The lion's share gathering ought to have its Opposition Leader in the Senate," he said. "The PPP has discussed changing the Senate executive. In the event that their choice isn't changed, at that point even the Senate director can be transformed," he said.